The phone today is entirely customizable, allowing you to do what you want to do with total ease and control. Want to dedicate your phone to photo editing and production? Easy, start by downloading a few editing Android apps, social media apps, and you will be good to go. Want to have lots of different news options? Again, all it takes is a few taps on your screen. Your phone can do so much for your day-to-day life, but if you want to transform it from a time-wasting platform to something that can help you advance your career and better yourself as a person you will want to download these top exciting apps today. 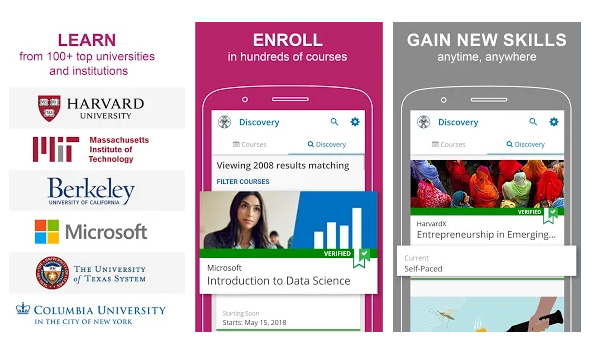 Education apps are storming ahead, and in particular, if you want to learn new concepts and even have a professional certification to show off at the end of if then look no further than the edX training app. With courses from Harvard, MIT, Microsoft, and so much more you have the cream of the crop for learning on the go. You can discover more about the edX online training app and take your knowledge further by heading online today. The new app version of edX training offers its users scope and flexibility, allowing users to learn on the go, with a schedule that works around them. With over 2000 online courses, specializing in your niche topic has never been easier, as you can stream or download online classes in a number of subjects. Every person and business should ideally keep up to date with the news. We live in a very dynamic society, and what happens in the world will affect our way of life in one way or another. Even just keeping yourself knowledgeable in how the world is changing will affect how it all plays out can improve us and the change the way we live. Businesses can keep up to date with their industry’s news, you can keep up to date with news going on in your hometown, and so on. Either use a news widget or download your favorite publisher’s app to enjoy. Learning a language takes daily practice, which is why downloading a language-learning app to your phone can be the perfect solution. We are all addicted in one way or another to our powerful pocket device, so use that relationship to your advantage. All it takes is fifteen minutes a day, and soon you can have an invaluable skill to put on your resume. With a low cost and even the possibility of reading for free – so long as you make use of your local library – you can read on the go anywhere. Brush up on fiction or expand your knowledge with non-fiction, there are passive and active benefits to enjoy so long as you enjoy to read regularly. When it comes to choosing the right note-taking app for you, it is wise to select the options that allow for cloud-based syncing. This way you can make changes on all of your devices and enjoy a seamless experience which will help you advance your career or work on your personal projects on the go. Improving yourself takes a regular commitment, and what is more regularly available to you than your phone is? Download these apps today so that you can finally start putting your phone to good use.